You can see what I found when I popped back in January after the gallery. On first sight, Fourtillfour was much as I remembered it, the outdoor terrace still basking in the Arizona sun. However, as I got closer, I began to notice the differences, a sign out front proudly proclaiming “House-roasted Coffee”. This is even more apparent if you enter from the side, where there’s a table selling retail bags of coffee. The real giveaway is inside. Although the main room, with the counter at the back, is unchanged, the side room, which used to offer additional seating, is now the roastery, a large Probat roaster taking pride of place, along with the obligatory sack of green beans, a washed Honduran single-origin, Nico and Mia having spent several months researching their options, including taking a trip to origin. In another claim to fame, Fourtillfour works directly with the farm, making it one the few coffee shop/roasters to deal solely in directly-traded coffee. For now, Fourtillfour roasts twice a week, going under the brand “Four Coffee”. Currently it’s just used in the shop, although you can buy retail bags to take home. The same coffee is used for both the espresso and batch-brew options. Naturally I had to try some, going for a shot of espresso, which, I have to say, was excellent. Although a little bright, it was really smooth and surprisingly sweet. I paired this with the last of the day’s blueberry doughnuts, an equally lovely concoction. Another change is that Fourtillfour, which only used to open from Thursday to Sunday, is now doing so well that it’s open seven days a week, although it still shuts at the relatively early hour of two o’clock. Dion’t forget to check out my full write-up of Fourtillfour, which includes a complete gallery. If you’re interested, you can see what I made of it in my original write-up, from January 2018. If you liked this, then don’t forget to check out the Coffee Spot Guide to Phoenix for more great Coffee Spots. 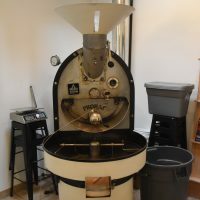 This entry was posted in Breakfast, Cafe/Roaster, Cake, Coffee Shops, Coffee Spot Updates, Coffee Terraces, Phoenix, Retailers, Roastery and tagged FourCoffee by Brian Williams. Bookmark the permalink.